What is Hybrid Mobile Phone Service? If you've got a reliable wifi signal at home, a hybrid mobile phone could save you a bundle by minimizing the use of cellular networks (which charge by the minute or megabyte) and maximizing the use of free wifi signals. 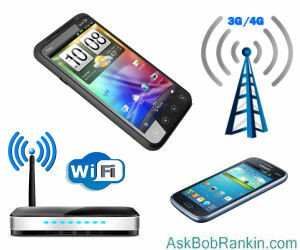 Whenever possible, your calls, text and data are handled by wifi. If there's no wifi signal available, the phone automatically switches over to a cellular network. Let's take a look at Republic Wireless, FreedomPop and TextNow Wireless, three providers of hybrid mobile phone service, to see what they offer and how they differ. I wrote about Republic Wireless a year ago, and how they are expanding their phone and plan offerings. The Motorola Moto X, Moto G, and Moto E phones are customized with Republic’s proprietary circuitry to seamlessly switch between WiFi and Sprint cellular service, even during calls. Prices range from $99 to $399. Republic Wireless service plans include a $5/month plan for unlimited talk, text, and data only over WiFi; the $10/month for unlimited talk & text over WiFi + Cell, and unlimited data over WiFi; and a $40/month plan with unlimited talk, text & data over WiFi + 4G. The $5 plan sounds great, but requires that you're within wifi range if you want to use the phone. FreedomPop popped up in 2011 with the mission to provide free mobile voice, text, and data services. Its plan for doing so is one of the more bizarre schemes I’ve seen, but it appears to work. First, FreedomPop bought a bunch of used smartphones. Then the company modified the phones’ ROM to route all calls over 3G or 4G data networks, essentially converting them into VoIP devices. Then Freedompop bought huge blocks of data on Sprint’s Wimax network at a very low cost per gigabyte. So now FreedomPop can offer a relatively cheap smartphone with a block of free minutes, messages and data. Phone currently available from FreedomPop are the HTC EVO 4G ($99), LG Viper 4G ($119), Samsung Victory 4G ($119), Samsung Galaxy S3 ($199), Samsung Galaxy S4 ($329), and the iPhone 5 ($399). You get 200 free anytime minutes, 500 free text messages, and 500 megabytes of free data per month. Of course, those free allowances go pretty fast. If you need more minutes, texts, and/or megabytes you’ll have to pay for them. Remember, you’re buying data allowances; it doesn’t matter how you use your bytes. Premium plans range from $11/month for unlimited voice and text with 500 MB of data, to $20/month for unlimited voice, text and data. The company is also selling home WiFi access points and mobile hotspot gear. There’s a distinctly sketchy feeling about the company’s complex freemium business model, product offerings, service plans, and add-ons. One example is the "Free Premium Services" that they try to upsell when you're buying service. If you don't read the fine print, you won't notice that it's only free for one month, and then $10 extra per month. And without Premium Services, you'll have to pay $2.50/month for voicemail. Yet people are buying; and rumor has it that Sprint is interested in buying FreedomPop. Textnow Wireless is a real innovator. It was the first company to roll out an all-WiFi mobile phone, and the first to raise seed funding from venture capitalists, Lady Gaga, and Justin Bieber’s manager. (Total: $1 million.) Originally a free SMS message service, Textnow has branched out into hybrid WiFi/cellular full voice, text, and data services. Like Republic Wireless, Textnow phones are designed to use WiFi when it’s available. When a user roams outside of WiFi range the phone seamlessly switches over to Sprint’s 3G or 4G network. A variety of phones are available at prices ranging from $29 to $199, or you can bring your own Sprint phone. Alternatively, the Textnow app turns any WiFi-enabled device into a phone, and it’s available in iOS or Android versions. There is also a free Web calling and texting service accessible via any Web browser, much like Google Voice. Obviously, these hybrid wifi/cellular phone plans will work best for those who have access to wifi most of the time. If you've got a reliable wifi signal at home, you'll only need to burn your plan's minutes or megabytes when you're out and about, and not within range of free public wifi. If you thought the pricing plans of major cellular carriers were getting too complicated, the hybrid scene may just drive you crazy. But innovation is always messy, and for some, one or more of these offerings may be just the ticket. Most recent comments on "Will Hybrid Phone Service Save You Money?" I have been using Republic wireless for about a year now with a Moto X and the $10 plan. It has worked out extremely well for me, with WiFi both at home and at work, as well as in a lot of public places. The phone will switch from Sprint to WiFi as necessary, and the transitions are pretty much seamless. I do have a spot in the house with bad WiFi coverage, and I manually switch to Sprint when I am there. One nice thing about the WiFi coverage is that when I am in bowels of a large building and the cell phone signal disappears, I am usually covered by a strong WiFi signal, which is an improvement over cellular service by itself. Check their literature, but I think the business model relies on the customer to realize that everybody is saving money when you talk on WiFi instead of Sprint. Cooperating with that business model allows Republic to keep the prices low to the customers. The service is good enough to recommend to your relatives! I'm not sure how many Canadian readers you have but I being one would appreciate it if you would let us know when you review issues such as hybrid mobile phone service's if it is available in Canada. My wife has been using Republic Wireless with the Moto X phone for at least a year now. Since she does not utilize the phone all that much it works great for her. I can't say how it would be for someone that uses their phone frequently though. I switched from Verizon ($50 per month without data) to Republic Wireless ($10 per month). Very pleased with the savings and service. Also pleased with the phone (Moto X). Have been using Republic for a year now and I love it. I pay $25.00 a month for the 3G service and have had no problems. Someone mentioned the advantage of using these phones when in buildings. Our Hospital complex is a wonderful example. Great wi-fi and most cell services do not work in many places in the complex. The Republic phone is becoming a mainstay here. Sprint has said they are ending their Wi-Max network in a year or so. Any carriers (like Freedom Pop)those use that network are out of luck soon. EDITOR'S NOTE: Not likely. Sprint is moving customers to their 4G LTE network, so I expect the hybrid carriers to do likewise. My daughter, son in law and I switched from Verizon to Republic Wireless early this year and have been nothing but pleased with the 1. cost/month ($25/month plans), 2. Coverage (I travel a lot and find that it is as good or better than Verizon in many cases), 3. Company response to questions or need of help. I never can tell any difference or change when the phone switches from cell to wi-fi and the quality is very satisfactory. I have recommended it to many people. Actually, I never heard of these services before, and I am interested. But I really don't need a phone; I have a TracFone for emergencies, which I never use now. What I need is internet access for my laptop or potentially, for a tablet. Is there ANY service out that that will give me reasonable internet access (not just wifi) for not an arm and a leg? I have been with Republic since its inception. Had the LG Optimus, Motorola Defy and now the MotoX. I have had no problems at all with their service. Bob, good, interesting article. As I see it, the new Hybrid phone would be great, for travelers and business people. For someone, like me ... It really doesn't matter, since, I only use my Smartphone, for personal use, calling Hubby, when I am out doing errands or shopping. I happen to have a U-Verse router, which is a Pace Router. I pay a lot, to have a large broadband width, for mostly the downloading of movies. However, having a large bandwidth, is really a bargain, in the long run, since, all of my family can use my Wi-Fi, when visiting. Plus, at family functions, there is enough bandwidth, to go around. I also, have a Land line phone. Yep, I am one of those, who, refuses to give up, on the basic house phone. For those who use their Cell Phones, as their main phone, there is a problem. When you need an ambulance, right now, calling 911 using a Cell Phone, doesn't give the 911 Operator, your address. Yes, you can give it to them, but, when someone is having a full Cardiac Arrest, time is of the essence!!! Aren't there any security issues using public WiFi with these phones? EDITOR'S NOTE: Possibly, if the calls are not encrypted. I know that Republic Wireless does not encrypt, because they say it will impact call quaility. Others I'm not sure about. I've been on Republic Wireless with the Moto X for a year now and am very pleased with the service. $25/month unlimited 3G works great in most areas I visit. Just today I was driving to a friends house listening to a podcast streaming off the net. At that friends house, not hooked in to their wifi, watched a couple of youtube videos. Zero hiccups in the data stream. Without hesitation I recommend their service.